LCD flat screen monitors lack the flexibility of CRT monitors. LCD monitors have a fixed pixel grid array. A monitor spec like 1600x1200 means the LCD screen is built with 1,600 'pixels' (really a trio of color pixels) horizontal and 1,200 'pixels' vertical. The general rule is you can only count on an LCD monitor looking good if the computer screen resolution matches the monitor. This is called driving the monitor at its native resolution. My tests on LCD monitors done in stores lowering the PC resolution generally confirms the rule, most of the time the non-native resolutions look pretty bad. 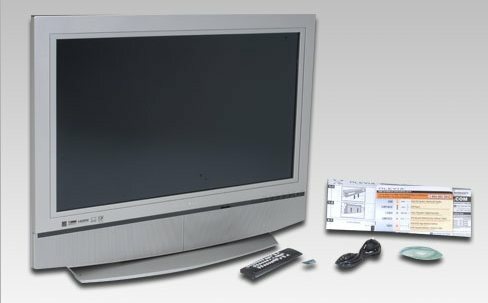 Flat screen LCD computer monitors are getting bigger and cheaper all the time. You would (naively) think a bigger LCD monitor would be easier to see with larger images and text, but for the most part that's not true. The reason is that larger PC monitors (almost?) always have higher native resolution. LCD monitors appear to be made with with the same, or a very narrow range, of pixel spacings, so a large screen has more pixels, hence a higher native resolution. The result is the text and images on a 20" monitor are (about) the same size as a 15" monitor. Pixel resolution in HDTV's are determined by the characteristics of high definition TV pictures. Most current HDTV's are designed to display 720 lines progressive and have a PC compatible vertical resolution of 768. As the screens get bigger, the pixel count does not change, the pixels are just farther apart. This is just what we want for easier viewing. Larger HDTV screens run at their native resolution will have larger the images and text. (update, Nov 06) A new class of higher resolution HDTV's is beginning to show up in stores. This type of HDTV, being advertised as 'Full Res Hi Def', can display 1,080 lines progressive. It's more expensive because it has a substantially higher (1080/720 = 1.5) density of pixels per inch. If you want the largest PC text and images, then this newer 1,080 line HDTV is not what you want. You want the older, and cheaper, 720 line HDTV, where the pixels are more spread out. What's the difference between PC monitors and HDTV ready sets? The difference between PC monitors and HDTV ready sets with PC inputs and no turner is really pretty small. One difference is in the screen. Large HDTV sets have a larger spacing between the pixels and that translates into more screen area for the money. HDTV sets have video input as well as PC inputs, so they are more flexible and can do double duty as PC monitor and TV display. The spec for my Olivia HDTV without tuner shows it has some picture enhancing features like comb filter and 3:2 pulldown that you don't see in PC monitors. However, my guess is that these processing circuits are only used when input is through the video ports and do nothing to enhance computer DVD movie quality. Prior to upgrading to an HDTV monitor I used a 17" CRT monitor. I sat about 4 feet from it so I could use the distance lens of my bifocals, and I ran it at 640x480 to get the largest text and image size possible. Below are the screen dimension of a 17" (4:3) CRT monitor and a 32" widescreen (16:9) HDTV. When the 32" LCD is driven at its native resolution (1360x768) and the 17" CRT at 640x480, the text and image size on these two monitors is (almost) exactly the same. The 32" screen is 163% (15.7"/9.6") higher than the 17" CRT, just enough to handle the 160% (768/480) more lines the computer will be sending . The 32", however, will have a huge advantage in that is has over 350% more screen area.. I recently began using a 32" HDTV as my computer monitor. Olevia is a lower cost HDTV, but looks good in the stores and gets very good reviews. After seeing a 27" Olevia in a store connected to a PC that looked great, I bought the 32" Olevia HDTV (model 332H without tuner) ($650). It has both analog (VGA) and digital (HDMI) PC inputs. Most, but not all, LCD HDTV's have connectors for connecting a PC. Wow, this is a great PC monitor, bright, sharp, good contrast, and good color. Not only does it run great at its native 1360x768 resolution, but (surprisingly) it's superb at 800x 600 and pretty good too at 640x480 if you need really big text. I am probably going to run it at 8 feet distance at 800x600 or a little closer at 1360x768. All my testing to date has been with VGA from a new, low end PC from Compaq. The Olevia comes with a remote that makes it easy to change screen setting and brightness. I find at either 800x600 or 1360x768 there is some combination of DVD player setting and Olevia setting so that the movie will fill the screen. The DVD movies from the PC on this monitor look superb. There is no way I can go back to my 17" CRT monitor. (Update 3/07) New price at Amazon is $521 (down from $650). Amazon now has a total of 8 reviews (mine was the first). Everyone loves this monitor. Many are using it as a computer monitor and game station display as well as a TV. My local idiot electronics stores still don't routinely have any HDTV's hooked up as computer monitors. I bet most people are still unaware that HDTV's work with computers, much less knowing they can be a good choice. For reasons unknown to me how a monitor handles non-native resolution seems to vary a lot. I thought a while back I had it figured out that integer scaling (PC resolution at exactly half the monitor resolution) was likely to work. I was going to buy a 1600x1200 monitor and run it at 800x600. A few people online said there were doing it, but when I tried it in a store, it looked bad. I was pleasantly surprised to find that my Olevia works well at resolutions lower than its native resolution. Here's close up pictures I took of text (title of this essay) on my HDTV monitor at two different resolutions. A plasma HDTV should not be used as a PC monitor. The reason is that your browser home page is likely to 'burn' its image permanently into the screen. I am going to pass on a hard won bit of PC information here ---- Two or three years ago when I got a new PC it came with a new operating system, Windows XP Home. I went to Control Panel/Display/Settings to set the screen resolution to 640x480. This resolution gives the largest text and images, and I had always used it with previous versions of Windows. It wasn't there! The resolution slider bar stopped at 800x600, the goofs at Microsoft had eliminated it! I did a Google search for 640x480 and came up empty handed. Months later I found that 640x480 resolution is available, it's just hidden! Here's the procedure --- First you force Windows into 640x480 resolution using the Compatibility mode. Compatibility is a tab under Properties of program icons. On the Compatibility screen check 'Run in 640x480 screen resolution'. This compatibility choice is grayed out in newer programs and Windows utilities, but it will be active in older programs. Start that program and it will cause Window's to switch to 640x480. Of course, when the program is closed, Windows just switches back to the original resolution. So, here's the trick. Start the program with the 640x480 compatibility tab checked, but don't close it, minimize it. Now go to Control Panel/Display/Settings. Surprise! The slider bar will now include 640x480. If it's grayed out, just wiggle the slider bar and it will become active, then just click Apply/OK. You're done. The next time (and every time) you start your PC it will come up in 640x480.